Where: On any road but especially in mountainous areas. 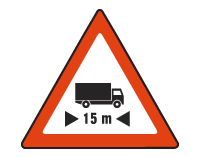 Purpose: To warn that curves in the road or other structures on the side of the road make it impossible for vehicles longer than the length indicated on this road sign. Action: Find an alternative route if your vehicle is longer that the length indicated in metres on this sign.